There’s no better way to experience the dazzling impact of digital signage than a tour in a stretch-limo down the Las Vegas Strip during Digital Signage Expo (DSE) week. “Coming up on the left is Harmon Corner—it has the largest LED wall on the Strip,” said Jeff Gray, executive account manager in Gaming & Hospitality for Samsung Electronics America, and guide for our tour. The 60-by-306-foot, Prismview curved application wraps around the third story of the building. “It lights up the entire intersection at night,” he said. In 2015, Samsung purchased Utah-based YESCO Electronics and rebranded it as Prismview, a Samsung Electronics Company. 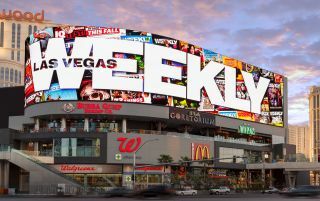 The acquisition positioned the company as a major player in outdoor LED digital signage responsible for a vibrant gallery of digital canvases throughout Las Vegas. “We’ve got thousands and thousands of guest rooms on the Las Vegas Strip with Samsung’s H.Browser, and system on chip (SoC) design,” said Shawn O’Connell, director of sales in the Enterprise Business Division for Samsung Electronics America. “It allows the integrator to code directly over IP to the back of the Samsung hospitality-grade television,” he added. Firmly in high-roller territory, O’Connell reports there are 75,000 Samsung hospitality-grade televisions in hotel rooms and casinos on the Strip. As the limo approached The Cosmopolitan, O’Connell noted, “we have signage in the elevators, a number of small videowalls and standalone digital signage, and—of course—all of the guestrooms.” Every guestroom in The Cosmopolitan has either a 65- or 55-inch Samsung TV. “They’ve got full IoT control using Crestron as the infrastructure,” he added. On the DSE show floor, Samsung showcased several of its SMART signage innovations and displays which included the LED Display IF Series with fine pixel pitches, to the 82-inch QLED 8K Signage, to its OMN-D series, an out-of-the-box ready, double-sided screen optimized for storefront window environments. “In the past, digital signage in various industry verticals was often more focused on futurism and the ‘wow factor’ rather than fully developed deployment strategies,” said Mark Quiroz, vice president for the Digital Signage Product Group, Samsung Electronics America. Just a few years ago, an attendee would walk the DSE exhibit halls and see a variety of disparate solutions. Display manufacturers would tout resolution, bezel-thinness, nit-brightness, and pixel pitch. Content management systems (CMS) solution providers might show grids and templates. Foundational companies demonstrated innovations in mounting and supporting the hardware. An overstatement, perhaps, but not too far from the truth. Increasingly, however, manufacturers are choosing to present the experience rather than leading with the hardware and software. Walking into Epson’s booth at DSE 2019, attendees were transported into a stunning and engaging home décor retail shop on one wall where colorful vines of 2D flowers appeared to grow out of physical vases onto the wall. Epson presented three activation spaces that were thoughtful, beautiful, and inspiring. “A lot of retailers talk about how they're struggling to engage people the in same way as the online experience,” said Remi Del Mar, senior product manager at Epson. “We wanted to bring some of that online experience—of being able to get a little bit more in-depth about products—to the shelf,” she said. The majority of the wall activations were driven by Epson’s LightScene EV-105 Accent Lighting 3LCD laser projector. The hourglass shape on the wall was created using the PowerLite L615U, a 6,000-lumen projector targeted to classrooms. “It’s about thinking of new ways to incorporate technology,” said Del Mar. Optoma showcased an enchanting experience using 3D-projection-mapping content. Using Optoma’s ZK750 4K UHD, 7,000-lumen projector, animations were brought to life over each of the four table settings, while “Le Petit Chef” and his team assembled dinner and entertained guests. Sharp created three interactive experiences which included a travel agent, a shopping experience, and a hotel lobby destination content to showcase the capabilities of its smart signage technology. Sony made a statement at this year’s DSE by more than tripling its presence over last year. The team from the powerhouse brand was there, en masse, with its BRAVIA Signage brand and its three levels of offerings: standalone, networked, and cloud (through its partnership with iRevo). One of the most significant barriers to entry for digital signage has been the inability to justify the hefty price tag not only for the upfront hardware, but to continued operation. Without a clear path for monetization showing a return on investment (ROI), the category has sometimes been viewed as a tough sell. But this is changing. The biggest trend at DSE 2019 was the number of manufacturers and solution providers offering varying degrees of integrated data analytics through third-party relationships. This type of intelligence helps retailers make informed decisions and can clearly demonstrate an ROI. “When we go deeper into content strategies, it [ALP Pro] can say play this, but not this because we have high levels of inventory coming in,” Ventura added. Panasonic showed its turnkey quick service restaurant (QSR) Self-Service Kiosk that automatically promotes upselling opportunities to customers, increasing retail and food service profitability. “Businesses are using professional displays with very specific objectives in mind—placing screens strategically and using a wide range of tools to maximize relevance and transform experiences,” said Samsung’s Quiroz. One of these tools is Samsung’s Nexshop analytics platform-based solution which helps retailers to deliver contextually aware content by analyzing customer behavior collected in-store. Peerless-AV demonstrated its fully integrated Smart City Kiosk by showcasing its partnership with VSBLTY Groupe Technologies. VSBLTY provides audience measurement using machine learning through computer vision. VisionCaptor combines interactive brand messaging with its FacialAnalytics. Measurement technology records engagement rates, interactions, sentiment, and real-time behavioral analytics. CyberLink demonstrated its AI engine, the FaceMe facial recognition system. Powered by deep learning and a neural network algorithm, it yields up to a 98.5 percentage true acceptance rate (TAR). The results are used for edge-computing security systems, and person identification solutions as part of smart cities, retail, offices, and homes. Retailers have the option to target marketing to an identity or an individual. “In one instance, you are visitor 630; I can target my message to you every time you come in the store, but when you’re not in the store I have no way of accessing you,” said Campbell. “But if you are willing to sign in, and give me authorization with your email, next time you come as Susan, and we saw you smiling at that dress yesterday, we can send you an email and let you know it’s on sale tomorrow—come on by,” he explained. On the flip side, let’s say you want to reach customers with your message wherever they might be hanging out—maybe the mall, driving on the highway, or an event. “Every location has an exposure area that has mobile devices pass through,” said Jonathan Gudai, CEO of Adomni, a digital signage software company that specializes an online platform to manage and sell ads on digital screens, anywhere. Announced at DSE 2019, Adomni announced AudienceIQ. The new feature gives advertisers the ability to spend campaign dollars more effectively and target their audience based on behaviors. Think of it as the Google AdWords of physical spaces. “The location-based consumer insights provided by data industry leader PlaceIQ are driving an evolution in digital out-of-home (DOOH0 buying and selling,” said Gudai. Like so many areas of the AV technology ecosystem, digital signage is converging with the powers of IT to provide data-rich content and analytics. The path to solid ROI has never been clearer.